I wasn't planning to see this production until later in November - but when you get a premiere invitation from a friend who's gotten an invitation from the very lead of the show, you really can't say no... That being the case, I think I should include a disclaimer: in a way, I saw this production for free on the courtesy of Helsingin kaupunginteatteri. Like last year's Fiddler on the Roof, Helsingin kaupunginteatteri is again doing a musical based on a classic Russian story. 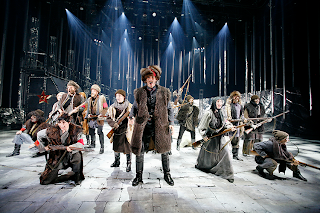 Doctor Zhivago the musical is, however, a bit fresher than last year's classic: this is the first production of the show in Europe! I was quite excited about this production beforehand, but it's been difficult trying to shove my thoughts into a nutshell afterwards. 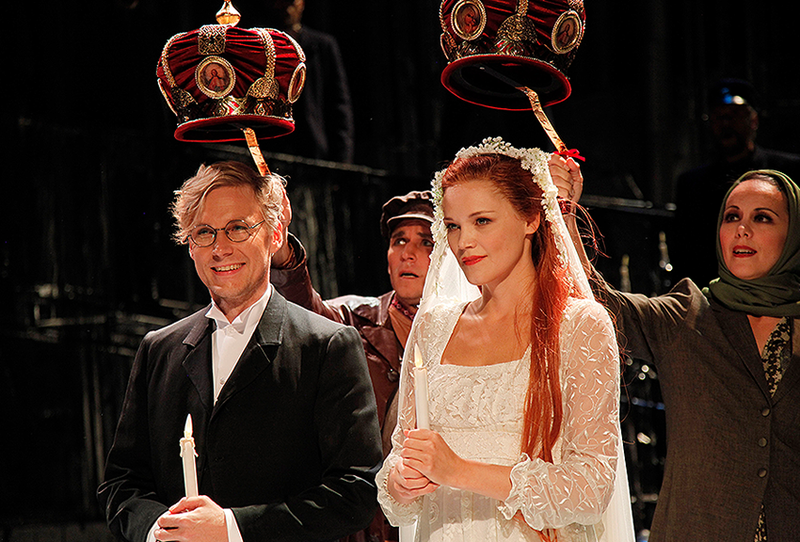 This musical had many elements I liked and I left the theatre feeling quite impressed. But after the initial excitement about seeing one of my favourite actors in a leading role and getting to be a part of the fancy premiere audience wore off, I was left wondering if I was actually much touched by the show after all. Doctor Zhivago, based on Boris Pasternak's Nobel-winning novel, tells a story of one man's life in tumultuous beginning-of-the-20th-century Russia. Above all, however, it's a love story – a love triangle in between the titular doctor and the two important women of his life. The show has been compared to Les Misérables multiple times, and having seen it now, I have to make that comparison once again. The similarities are striking: it tells the leading character's story from his prime to the end of his life, a revolution as a backdrop... 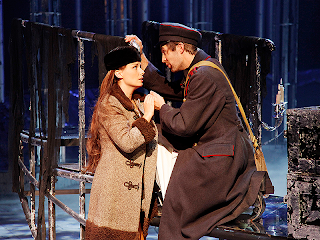 I dare you to watch either of Doctor Zhivago's act endings without being reminded of Les Mis. Doctor Zhivago has a tad simpler story and less characters than its French counterpart, but it also lacks a certain epicness that makes Les Misérables memorable. Maybe that's to do with the music. Doctor Zhivago's music is quite nice and beautiful. But oftentimes, it's nice and beautiful even during intense scenes. To me, Lucy Simon's tunes were perfect for romantic moments but felt lackluster during the biggest scenes. I think the music could've been more bombastic in the war scenes, more chilling when the villain was singing... Still, it's a shame there is no cast recording of this musical. I've a feeling these songs might grow on me, and I'd also like to hear the original English lyrics. The action, luckily, wasn't as mild as the songs. For example, I've never seen as disturbing an onstage death as one of the deaths in Doctor Zhivago. I felt freaked out, but in a good way. 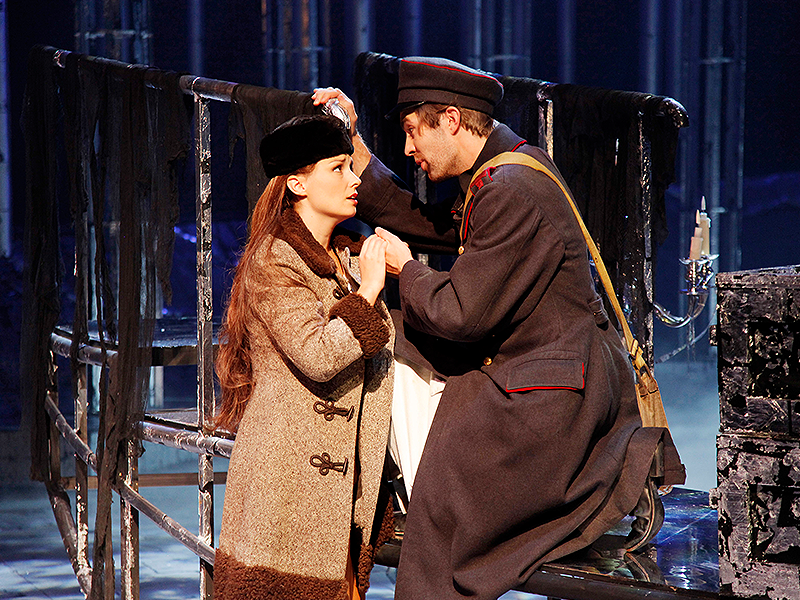 Tuukka Leppänen and Anna-Maija Tuokko were both quite intense in their leading roles as Yuri Zhivago and Lara, the forbidden love of Zhivago's life. I could listen to especially the former's singing for the whole night, and thankfully, he finally plays a part where he gets plenty of songs! I'm afraid, however, that I have to agree with whichever review mentioned that the chemistry in between the two leads was still a bit lacking. Maybe that was just premiere nerves, though? I wouldn't be surprised to see the relationship in between Yuri and Lara developing to feel more and more natural in the upcoming performances. My favourite character by far was Pasha Antipov, played by Antti Timonen. A truely evil musical villain, this one! You have all these antagonists, Javerts and Phantoms and Judases, who do awful things but who you are still expected to symphatise with... So, for once, I enjoyed this truely evil character. You can't even try excusing his actions, even when the motivations behind them are explained to you, and Timonen's take was chilling. I was impressed. I was also rather impressed by the looks of Ralf Forsström's set. Steely, icy, and still strangely beautiful, it suited the musical perfectly. For once, Helsingin kaupunginteatteri's huge scene didn't look too big. Forsström's costumes didn't impress me in a similar way, I thought they were mostly nice but nothing especially memorable – but two thumbs up for the set! 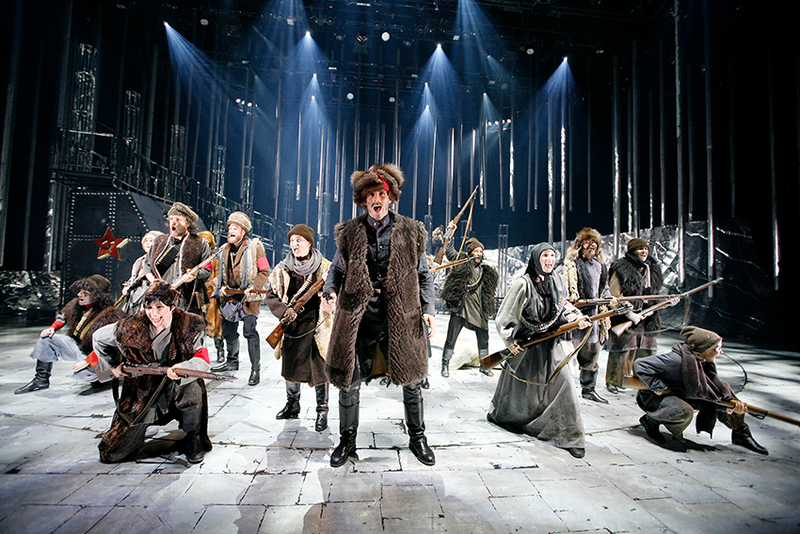 All in all, I think Doctor Zhivago the musical is worth seeing... but. You probably know the feeling. Sometimes, you see and acknowledge that there is a lot of good in a production, but you can't feel it in your heart. That is my relationship with Doctor Zhivago. I can't point out what is wrong exactly, but a certain flame is missing. The irrational part of my taste that arbitrarily decides which shows I love seems to crave for something else than what this musical delivers. I'll probably try seeing the show again in the winter for all the positive things I've mentioned here, but I doubt I'll be listing it as one of my personal favourites even then. Ha, I thought you might appreciate certain things in this. 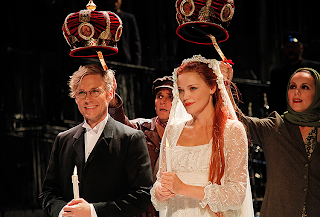 :-) I wasn't in the premiere and didn't see Tuokko, but it's a pity if they lacked chemistry, I hope they'll find it soon... Anna Victoria Eriksson was a good Lara and she had good chemistry with Leppänen, and it made the whole musical work much better. I saw the same less good things that you did, but the chemistry gave the story the motivation it needed and I liked the production despite acknowledging the less successful decisions. The directing was quite lame, but I was thrilled to see a love story that had morally less right aspects and that didn't end with a sensible marriage's triumph. I was expecting to see a huge epic love story like in Les Mis and Kristina and wasn't happy about it, so suddenly seeing a more realistic-feeling love couple with subtler nyances in the story felt refreshing.